This review was originally posted at my new blog, Southern In Law - check it out for daily posts, delicious recipes and lots of fun. It's time for another Saturday Spotlight (where has the week gone?!) and this weeks is a little different from usual. You see, my friends at Sony Australia sent me their SLT-a65 to have a play with and review for you all. I'm currently considering a new camera in the near future and as my current camera is a Sony of course I began looking at Sonys. I've had my current a300 for four years now and haven't had a single issue - touch wood. That's excellent for a camera that gets used so much so of course I would consider a camera that would give me the same loving. Sony do not currently make DSLRs like my current camera and have instead moved onto the DSLTs. I actually just wrote an article for HubPages on What is a DSLT camera? but I'll give you a quick outline! DSLT stands for Digital Single Lens Translucent - meaning it has a fixed translucent mirror inside the camera allowing the majority of light coming in through the lens to hit the sensor and deflecting a small amount of light onto the AF sensor. The main difference you'll notice straight away with a DSLT is that it seems more digitalised than the standard DSLR cameras. A DSLT camera requires an electronic viewfinder instead of the standardised optical viewfinder. The issue I had with the electronic viewfinder was that it doesn't have the same brightness or clarity of an optical viewfinder and it doesn't correctly show the image you're capturing. While the camera has a different functionality of DSLRs the images it captures are crisp and clear thanks to the 24.3 mega pixels - that's more than double my little baby. I found that the DSLT-a65 would be great as a start up camera as it has 7 scene functions that will automatically set the camera to shoot in different scenarios - night time, macro, portrait, sports etc. Though for someone using the camera on manual I found it was trickier to set than what I'm used to - on both my Sony and other DSLR cameras I have used. I loved that it had HD video recording as my current camera doesn't have any video recording and that's a function I'm really looking to have on any new camera I buy. I'm kind of sort of addicted to my zoom lens, so I would have loved to try this camera with the zoom lens to really get a feel for how it works, but regardless I was still impressed with the quality of the images and I'd really consider buying one as a second camera (if only I had the budget to have "a second camera") as it would be really simple for my family to use as well. What about the price? 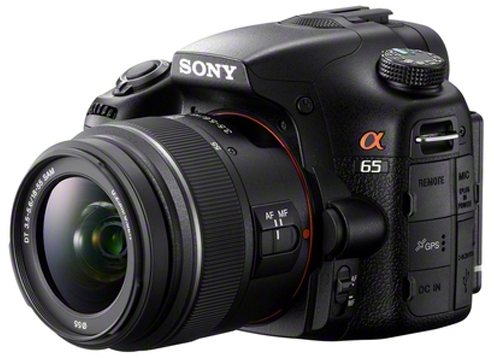 I know, that's what you're likely thinking if you're in the market for a new camera - the a65 with the standard lens kit is priced at $1, 299.00 (Sony's price). It's quite a reasonable price for a camera that produces such high quality images and this is because the DSLTs are cheaper to manufacture. Would I buy it yes, I would as a second camera. Currently I don't have the budget for a second camera because... you see... weddings are almighty expensive - as are visas. The HD video and the quality of the images are definitely the two main factors in why I would purchase the camera - both are excellent. On the other hand, the electronic viewfinder and the horrrrribleeeee digital beep instead of the regular shutter sound made me cringe. It sounds ridiculous, but as someone who can spend hours upon hours with their camera to their eye it's things like this that really get on your nerves. The first time I took a photo and heard the beep, I was taken aback - where was the shutter sound?!?! this is not right?!?!. I'm sure over time you would get used to both factors - it's just different from what I'm used to. If there were such things as birthday fairies, I'd definitely make a request for the a65 (If you are out there, birthday fairy - remember mine is the 12th of August!) and when the camera gets picked up this week they may have to use force to remove it from my clutches. If you're interested in finding out more about the DSLT cameras, check out my hub. Kristy received this camera on loan from Sony for the purpose of this review. I received nothing for my review of this camera and the opinions are entirely my own.